Travel through historic Custer State Park, along the granite pinnacles of the Needles Highway, and loop around to Mount Rushmore, where four of the most forward thinking American Presidents are carved. The road then heads through ranches and farmlands to Rapid City and into the mysterious and dry Badlands National Park. The hills of the Badlands. The scenic drive begins in Custer, which is easily reached from our Black Hills drive or US-16. From Custer, head north on SD-89. You will arrive at Sylvan Lake (W1), one of the jewels of Custer State Park. The lake is ideal for picnics, swimming, boating, hiking, and rock climbing. Boats are available for rent. From the Sylvan Lake, head west on SD-87, which is known as Needles Highway. This windy road passes through forest before surprising you with its incredible granite pinnacles. Standing tall and thin, the jutting rocks amaze and delight. Stop at the turnouts to photograph, climb and marvel at the surrounding scenery. The road continues through one lane tunnels carved from the rock with twists and turns all the way. In 10-miles, turn left onto Country Road 753. In a mile, consider a side-trip to the beautiful Center Lake (W2) by turning left on Center Lake Road. Continuing north for 3-miles, the road joins US-16, where this drive will head east. If you happen to miss Country Road 753, you will soon arrive at US-16 passing right in front of the Peter Norbeck Visitor Center. The US-16 is known as the Iron Mountain Road and has many twists and turns, particularly as you head up the switch backs before arriving at the Norbeck Overlook (V1), one of the best views of Mount Rushmore. Stop here for more outstanding vistas and to learn about the area’s history from interpretive panels. Four miles and three tunnels after the Overlook, the Mount Rushmore National Memorial (H1) is a short side-trip on SD-244. The Mount Rushmore National Monument has a visitor center where you can learn about the carving of Mount Rushmore and why Thomas Jefferson, Abraham Lincoln, George Washington, and Theodore Roosevelt were chosen for this national monument. Enjoy short films about the monument, it’s history and the surrounding park area and visit the sculptor’s studio. Continuing north on US-16, turn right onto Reed Road in 1 mile, which will become SD-40. In 15 miles, the SD-40 ends at SD-79, where this scenic drive heads north for 17 miles when you will arrive in Rapid City, South Dakota’s second largest city. In Rapid City, take a side-trip on Skyline Drive (T2). The road winds up a ridge of sandstone with a series of sharp turns. At the end of the drive, revel in spectacular views of the city, the Badlands, the Black Hills — and seven, huge concrete dinosaurs in Dinosaur Park. Now on the Register of Historic Places, the unrealistic but charming dinosaurs were created in 1936 as a tourist attraction, reflecting the science of the time. The park is free and there is a Gift Shop/Visitor Center/Eatery on-site. In downtown Rapid City, learn about the history of the Black Hills through interactive exhibits on geology and paleontology, the Lakota people, European settlers, visit the planetarium and more at the Journey Museum (M1). From Rapid City, head east on SD-44. You will pass many ranches and farming communities. As you continue eastward, you will notice the landscape becoming more open and the views more vast. In 40-miles, the road arrives in the town of Scenic. Shortly after turn left onto Country Road 590 which will bring you to Sage Creek Road which quickly becomes a gravel road. If you aren’t much for gravel roads, you can continue on SD-44 and continue onto SD-377 and head west on SD-240 after Interior for the remaining views. Heading east on Sage Creek Road, you will soon enter the Sage Creek Wilderness, part of the Badlands National Park. Many of the trails in this section are unmarked and not recommended. About 5-miles from the end of the dirt road, stop at Roberts Prairie Dog Town (A3) to see a community of prairie dogs in their natural habitat. Next to the Badlands, the Buffalo Gap National Grasslands (H5) is one of three such parks in South Dakota that celebrates the lush grasslands. At the end of the dirt road, the road joins onto SD-240, which this drive continues east on and the hills of the Badlands begin to emerge. Take advantage of the pullouts for incredible views of this unique landscape. Millions of years of sedimentary layers, shaped by wind and water create a fascinating and diverse landscape. As well, there is a wide variety of wildlife, bison, bighorn sheep, deer, pronghorn, prairie dogs, and black-footed ferrets. 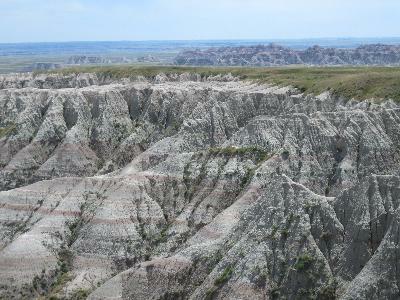 Badlands National Park is home to many fossilized creatures from the past, including dinosaurs. Fossil Trail (H4) is an easy, .25-mile boardwalk path that displays some of these fossils. Remember to always have water with you in this area — especially in summer as the heat is dry and intense and shade is not easily found. A full tank of gas is also recommended before driving into the Badlands. As SD-240 joins SD-44, the Ben Reifel Visitor Center (I3) is nearby and a great place for more information. Continuing east on SD-44, you will find a parking lot where you can access many trails (H6) which offer something for everyone. The Doors Trail is a 1/4-mile hike that gives you a flavor of the Badlands. The Window Trail is an accessible 1.5-mile hike through the eroded canyons. The Notch Trail is a 1.5-mile hike that brings you to some of the Badland cliffs; it is not recommended for those with a fear of heights. The Castle Trail is a 5-mile hike across the road that brings you to many of the Badland formations. If you have the time, spend the night near or in the Badlands to enjoy the night’s sky. Millions of stars are clearly visible here, an awe-inspiring sight that many of us do not get to experience due to the bright city lights. The scenic drive completes as you arrive in Cactus Flat. If you are doing this drive in reverse, be sure to explore Custer and the Black Hills.